Basecamp – I love what 37 Signals does, really enjoyed their insightful book ReWork but basecamp didn’t feel right to me. TeamBox – By recommendation from fellow web developer, very systematic approach but slightly confusing to use, maybe it’s just me. Wunderkit – Beautifully designed App, worked a little slow for me and frankly I felt the heavy graphic slightly distracting. 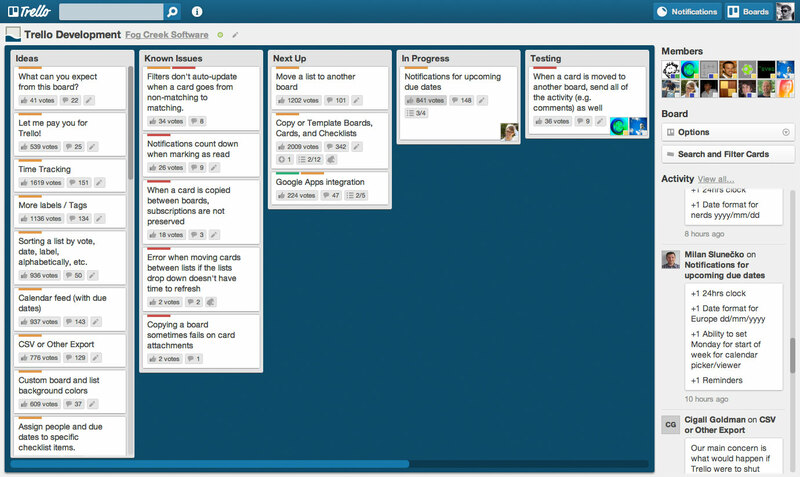 Trello – The very tool this post is based on, carry on reading for my thoughts. As I’m sure you have worked out by now I ended up chosing Trello as my project management tool of chose. It’s flexiblily is absolutely amazing, it’s as close as you can get to having a whiteboard with stick notes, you can change the titles how ever you like, restructure boards if needed and assign members of your team to task with a simple drag and drop, this is an absolutely fantastic tool. I really like how the team really take their time to communicate with the community, exchanging ideas, reporting progress and milestones to each new feature, conveniently by using a Trello Board. Although it’s currently free, like DropBox and Evernote I would gladly pay money for their excellent service. Great recommendation Chi. I took a look at Trello and have now rolled it out to everyone at BrandAmmo! While Trello doesn’t cover everything to do with project management, it’s a great (and free!) tool for simple job management, collaboration and hashing out ideas. Nice work! For a more complete project management solution, including: reporting issues, creating metrics, assigning tasks, allocating & tracking budget, recording knowledge, collaboration, and many other uses, I have always been a fan of Bugzilla, an open source project by Mozilla. Its quite a mature project now from the days when I was playing with it and it is quite adaptable for any business. I personally think they should move it away from being called Bugzilla because its portrayed being only for software development. Keep letting us know about other cool tools!